As the first female-led Marvel Cinematic Universe movie, Captain Marvel is arriving in theaters under a heavy burden of expectations. Even after years of fans clamoring for a Black Widow standalone movie, it took a full decade and 20 MCU films for the franchise to produce a single movie with a woman protagonist. And it took the example of rival studio DC Entertainment releasing Patty Jenkins’ Wonder Woman to both critical and monetary success. That gives Captain Marvel the triple challenge of living up to past MCU films, proving a female-led movie can make the company money, and squaring off against one of DC’s biggest hits. But even without the challenge of breaking new representational ground for the MCU, Captain Marvel is facing sky-high expectations because of the MCU films immediately preceding it. Thor: Ragnarok director Taika Waititi brought a new irreverence to the MCU, while also lining up Thor, Hulk, and Doctor Strange for Avengers: Infinity War. Then came Black Panther, in which director Ryan Coogler took Marvel fans deep into the story and culture of the African nation of Wakanda, breaking box office records and giving Marvel its first Oscar-winner. That film dovetailed neatly into Avengers: Infinity War, which linked together 18 previous films, made $2 billion worldwide, and eradicated half the universe’s population. Even Ant-Man and the Wasp, the first Marvel film with a female character in its title, felt like it was queuing up expectations for Captain Marvel, and for the fast-approaching Infinity War sequel Avengers: Endgame. After all of that, Captain Marvel is in the unenviable position of having to introduce a new character to the MCU, lay out her origin story, tie her in with the current MCU timeline, create backstories for several previously established characters, and set up even more significant elements for Avengers: Endgame. But Captain Marvel mostly bears the weight of those expectations. It rises to the occasion with strong performances and with its directors’ willingness to slow down and take their story seriously, balancing humor, action, and exposition in a carefully calibrated package. When Starforce is assigned to recover a spy, Carol ends up in the hands of the Skrulls, a race of shape-shifting aliens at war with the Kree. The Skrull leader Talos (Ready Player One villain Ben Mendelsohn) has one goal, and he’s willing to root around in Vers’ memories to get it: the Lightspeed Engine, which could turn the tide of the war in the Skrulls’ favor. But Talos’ trip through Vers’ memory unlocks visions of her past as Carol Danvers, which lead her to planet C-53 (Earth) in the 1990s. There, she gets the attention of Nick Fury (Samuel L. Jackson, this time with both eyes intact) and Phil Coulson (Clark Gregg, with more hair than he has in The Avengers or Agents of S.H.I.E.L.D.). Danvers and Fury’s sarcastic verbal dueling becomes a highlight of the film, as Vers steps out of a highly advanced civilization into a world of pay phones and strip malls while wearing a Starforce uniform and talking about shape-shifting aliens. 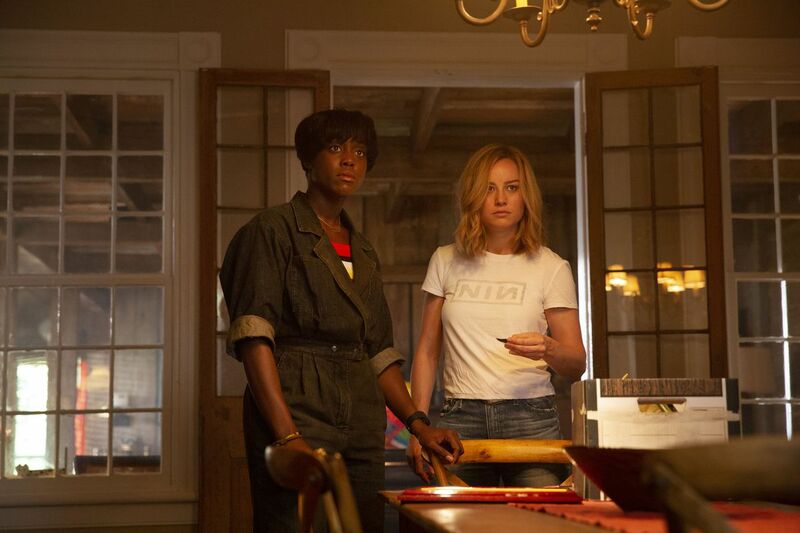 The 1990s nostalgia is strong in Captain Marvel. Directors Ryan Fleck and Anna Boden weave the futuristic elements of Carol’s story into the retro time period through everything from clothes to cars to music. Fleck has said music was the first thing they concentrated on during pre-production by creating a playlist that wound up including songs like No Doubt’s “I’m Just A Girl,” Nirvana’s “Come As You Are,” and R.E.M.’s “Man on the Moon.” Much like with the Guardians of the Galaxy movies and their classic rock anthem mixtapes, Captain Marvel uses the soundtrack as a kind of running gag, driving audience nostalgia while playing up the humor of adding familiar songs to alien situations. But bringing across that level of love, confusion, and commitment requires a lot from Larson, who’s essentially playing three roles in this film: Vers, Carol, and Captain Marvel. Each has her own journey and challenges, and each feels rounded-out and relatable. Larson’s ferocity in the action scenes and her quiet pain in deeper moments all feel organic. The story feels jumbled at times, but her strong, relatable performance provides the connecting thread. The action can be less convincing, however. Brie Larson reportedly trained for four and a half hours a day over the course of 10 weeks to prepare for her fight scenes in Captain Marvel, but apart from a close-up early sparring match between Larson and Law, most of the combats are edited in such a choppy, jump-cut-focused fashion, it’s hard to see what the actors are physically capable of bringing to the table, and it rarely feels like they’re actually executing the moves. The one hurdle Captain Marvel doesn’t entirely clear comes in its story execution. Its primary narrative, around Vers / Carol / Captain Marvel and her voyage of self-discovery, falls together well, following Marvel’s usual patterns of drama and humor and rising and falling action. But the story gets trickier when Captain Marvel has to pull together elements of both the MCU past and future. 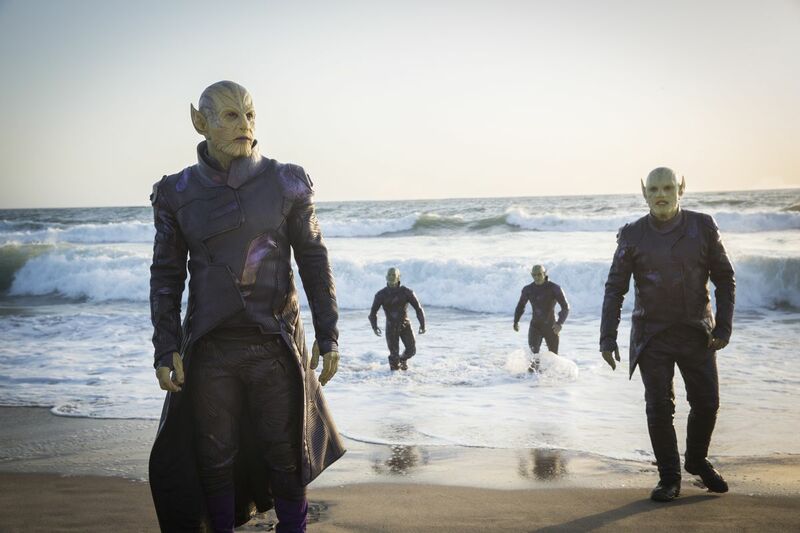 The Kree, already seen as villains in Guardians of the Galaxy and Marvel’s Agents of S.H.I.E.L.D., are portrayed as heroes here. In Guardians, Ronan the Accuser (Lee Pace) was a madman hellbent on destruction, and viewers may have a hard time wrapping their heads around his placement in Captain Marvel. Marvel stalwarts may appreciate the way some puzzle pieces slot together, but more casual moviegoers may find the information dumps and the film’s many seemingly unrelated or unjustified elements daunting and confusing. But the filmmakers don’t shy away from the complexity of their story. Charged with setting up Captain Marvel as a necessary element to counteract Thanos in Avengers: Endgame, they give her a rich backstory and a believable motivation. Captain Marvel sometimes feels overstuffed on story elements, but each of those individual elements feels important and meaningful, from the extended flight scene that marries humor and danger to the banter that has Fury laying out his entire history for Carol’s amusement. Some of it may drag a bit in isolation, but it largely feels necessary for the larger story. Ultimately, Captain Marvel gets its many jobs done, and it looks pretty good doing it. As a first-shot representation movie, it isn’t as game-changing as Black Panther, and it isn’t as adventurous as Thor: Ragnarok. But it does deliver the girl-power narrative the MCU needed on a level to rival Wonder Woman, and not just by making Captain Marvel a powerful hero. It also makes her an admirable person, one with good friends and goals worth fighting for. And it firmly establishes Carol Danvers as one of Marvel’s mightiest superheroes, which is exactly what the Avengers will need in Endgame.